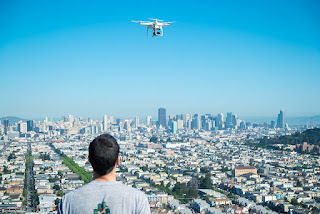 If the idea of swarms of delivery drones dropping packages all over our cities started out as a joke, for some reason the punchline hasn’t landed yet. Amazon applied for a patent in 2015 for a command center, like a beehive, plopped into your city, which isn’t a worrying metaphor at all. Google has its own program in the works, which at least for the moment involves delivering burritos. Again, if this is a joke, it’s got a very long fuse. Forget about the insane logistics of such a system for a moment, or if you’d even be keen on drones swarming your town. The big question is: Would this actually be a better, more efficient way to go about things than traditional delivery trucks? Without a real system in place, that’s tough to answer. But today in Nature Communications, a group of researchers have taken a shot at modeling the energy efficiency of delivery drones, and compared it to classical fleets of delivery trucks. Which comes out on top? It depends, basically—on a slew of factors that you probably haven’t begun to think about. But they’re the same ones companies and regulators will have to chew on as automated delivery becomes more plausible. First off, different regions of the country employ different levels of renewable energy like solar, which means charging all those drones would release different amounts of carbon dioxide depending on where you live. So for this study, the researchers compared emissions impacts at both ends of the spectrum: in a very green state, California, and a very not green one, Missouri. For a small drone to operate out of a warehouse in California, it’d be responsible for about 430 grams of CO2 per package delivered, compared to a diesel delivery truck producing 915 grams. But in less-than-green Missouri, a small drone would be responsible for about 850 grams of CO2 per package, while a truck would emit 1,100 grams. So for California, that’s an emissions savings of 53 percent; in Missouri, 23 percent. That’s a relevant difference, because given current battery technology, one drone carrying one package to one destination can fly just a little over two miles. These researchers assumed that warehouses—where drones could load up and charge would be built to accomodate that limited range. The relatively small city of San Francisco would need four, while the greater Bay Area would need 100. But the more warehouses you put in to accomodate the drones, the more energy you're using to heat and cool them offsetting the energetic benefits of air delivery.The researchers didnt factor in the energy differences as far as semi trucks to four different warehouses as opposed to one. One way around that problem might be repurposing existing facilities into drone homes. So for Amazon, which now owns Whole Foods, drones could deliver groceries from the roof of stores already dotted through cities like San Francisco. And that’s to say nothing about how different networks of drones would stay out of one another’s way. Amazon may have its own fleet, and Google another, and a grocery chain still another. You can get the many drones within your own swarm to get along, easy enough, but good luck occupying the same skies as someone else’s squadron without a confrontation. — While some companies consider airborne deliveries, others want to stay grounded with delivery robots. In San Francisco, for instance, a startup called Marble has been wheeling around one of the city’s most chaotic neighborhoods. — Well, at least it was for a while. Citing safety concerns, the San Francisco Board of Supervisors recently voted to severly restrict delivery machines on city sidewalks. — Meanwhile, in Rwanda, one startup is undertaking a rather more noble affair: delivering blood supplies via drones.